Description: CN 2583 and CN 2581 9-44CW's CN MacMillan Yard Dec 17 2006 basking in the sun with the Maple Leaf dancing in the wind. Description: CN 392 heads east through Durand. 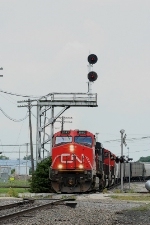 Description: Eastbound CN train races through town. Description: A432 SB at Cemetery Rd.